Risk Reactor Inc.'s round shaped yellow green Glow in the Dark Toilet Seat will make it easy for you to respond to natures call at night. The lid comes down slowly not making a noise. During night time trips to the bathroom can be a dangerous adventure. Now with your new glowing toilet seat you can see what you are doing. Perfect for the young, the old, and everybody in between. The phosphorescent color charges from almost any light source in minutes then glows all night. 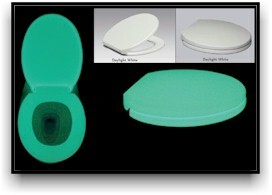 In regular light the toilet seat will appear whitish and then glows in the glowing color at night.